If you’ve spent any time online this month, chances are you have come across some scary headlines about a spa in New Mexico that possibly exposed clients to HIV or other bloodborne pathogens. 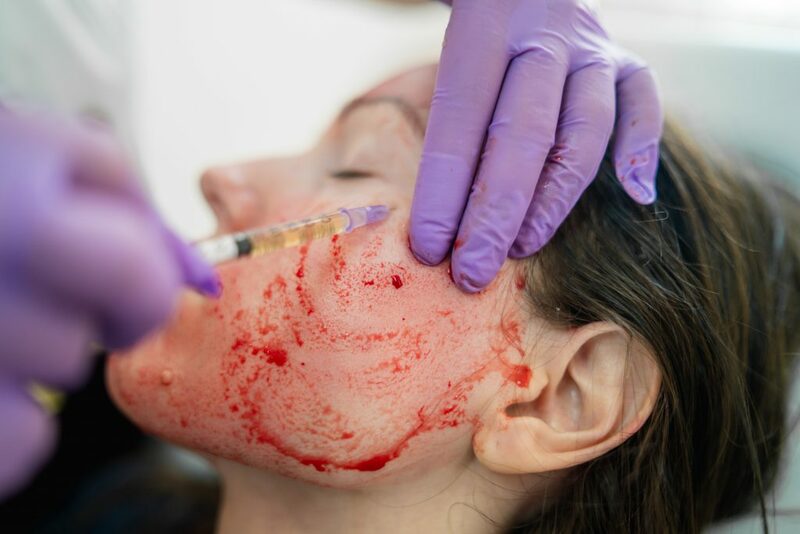 Articles like ‘Vampire Facial’ Becomes Actual Horror As N.M. Spa Clients Face HIV Testing or The “Vampire Facial” May Have Exposed Patients to HIV and Hepatitis B and C in a New Mexico Spa, Says the New Mexico Department of Health have popped up on sites ranging from CNN to Refinery29, highlighting a potential outbreak of disease linked to this popular beauty treatment. The onslaught of news around the incident has led many to question the safety of so-called “vampire facials.” As a board certified plastic surgeon with years of experience studying and vetting cosmetic technologies and techniques, Dr. Buford devotes much of his time to educating patients about both the benefits and potential risks of treatments so they can make an informed decision. Read on for his expert insight into the New Mexico incident and how it can be avoided in the future. First of all, what is a vampire facial? If you follow any beauty-conscious celebrities on Instagram, you may have come across this treatment prior to this month’s news. Kim Kardashian famously tried—and documented—the “vampire facial,” and it’s become an increasingly popular option for rejuvenating the skin over the past few years. The word “facial” tends to minimize the realities of the procedure—it requires drawing blood, properly purifying and extracting the PRP, and using a specialized medical device to create channels in the skin. It’s important to note that the term “vampire facial” was coined by one specific doctor in California and is somewhat misrepresentative of the treatment people receive, namely platelet rich plasma therapy with microneedling. Essentially, this treatment involves isolating platelet rich plasma (PRP) from your blood and administering it to the face with microneedling or direct injection. Because PRP contains a high concentration of platelets known to help regenerate cells, this treatment can be a wonderful option for reducing fine lines, helping firm the skin, and improving texture and tone. How dangerous are vampire facials? Despite the upsetting headlines, PRP therapy is not an inherently dangerous treatment in itself. Because your own blood is used, there is no risk of an adverse or allergic reaction to the plasma that is applied or injected. That being said, the word “facial” tends to minimize the realities of the procedure—it requires drawing blood, properly purifying and extracting the PRP, and using a specialized medical device to create channels in the skin. All of these factors require an experienced medical professional who works in a clean, well-equipped environment, uses sterilized tools, and is properly credentialed to draw blood and administer treatment. While PRP therapy is considered a low-risk option when properly and safely performed, it is a medical procedure and complications can arise if care is not taken—something that is true with any procedure that requires breaking the skin. Even “micro-injuries” created by a microneedling device or small injection sites can leave you vulnerable to infection if your provider doesn’t follow safety protocols and educate you on proper aftercare. What caused the public safety concerns in New Mexico? So, if PRP therapy is considered generally safe, why are officials warning folks in New Mexico about potential exposure to HIV and hepatitis? The location at the heart of the incident, VIP Spa in Albuquerque, is ultimately to blame—not the procedure itself. Dr. Buford encourages patients to be their own advocates. While there is never a 100% guarantee of safety when it comes to any procedure, you can limit your risk by working with experienced, qualified providers. After a client of the spa reported an infection, the New Mexico Department of Health investigated VIP Spa and determined that staff were mishandling needles and biological matter. Essentially, that means that if someone patronized the spa with a bloodborne condition and employees did not properly store, handle, and dispose of needles, they left their following clients open to transmission. Additionally, the owner of VIP Spa was not licensed to perform vampire facials or other injection-related procedures because she isn’t a medical professional. Her facility did not have the proper oversight or regulations in place to ensure medical services were being carried out properly and safely. Despite her claims of using disposable needles and following safety practices, the owner and employees should never have offered this treatment to begin with. While the investigation is ongoing, the spa has been shut down and the New Mexico Health Department is urging clients who received treatment at the spa in May and June of this year to go in for free HIV and hepatitis B and C testing. Ultimately, Dr. Buford encourages patients to be their own advocates. While there is never a 100% guarantee of safety when it comes to any procedure, you can limit your risk by working with experienced, qualified providers. Facials and other non-invasive treatments. While you can likely receive a basic facial from a spa without many concerns, there are still safety considerations that must be made with even the most gentle treatments—safe concentrations of product, preparedness in case of a negative reaction, and cleanliness of the tools and environment. Thus Dr. Buford recommends visiting a physician or medical aesthetician working under MD supervision for these options. Laser treatments, chemical peels, and skin resurfacing. Any treatment that resurfaces your skin—via chemicals, energy, or manual exfoliation—can be risky if not performed by someone familiar with the treatment and technology used. Chemical peels and laser treatments can harm or even scar the skin when administered by inexperienced providers and any form of resurfacing can leave your skin open to infection. A medical aesthetician, nurse, or PA overseen by a doctor will be able to customize treatment to meet your needs without risking your safety. BOTOX, fillers, PRP, and any other treatment that punctures the skin. Anything requiring a skin puncture with a needle should only be performed by a medical professional who has been properly trained. A board certified plastic surgeon, registered nurse injector, or trained aesthetician can safely inject or draw blood. Don’t be afraid to ask about your doctor’s or provider’s credentials; if they aren’t forthcoming, that’s a red flag and you should find another provider. If you’re in the Denver area, we’d love to help you understand your many options for addressing common skin concerns during a private consultation. Dr. Buford and his highly trained team take every precaution to ensure your safety, and they are happy to walk you through the process so you feel confident moving forward. Contact us today!